Who’s ready to Gobble Gobble??!?! I cannot believe that Thanksgiving is just a few weeks away and it is time to prepare for the feast! 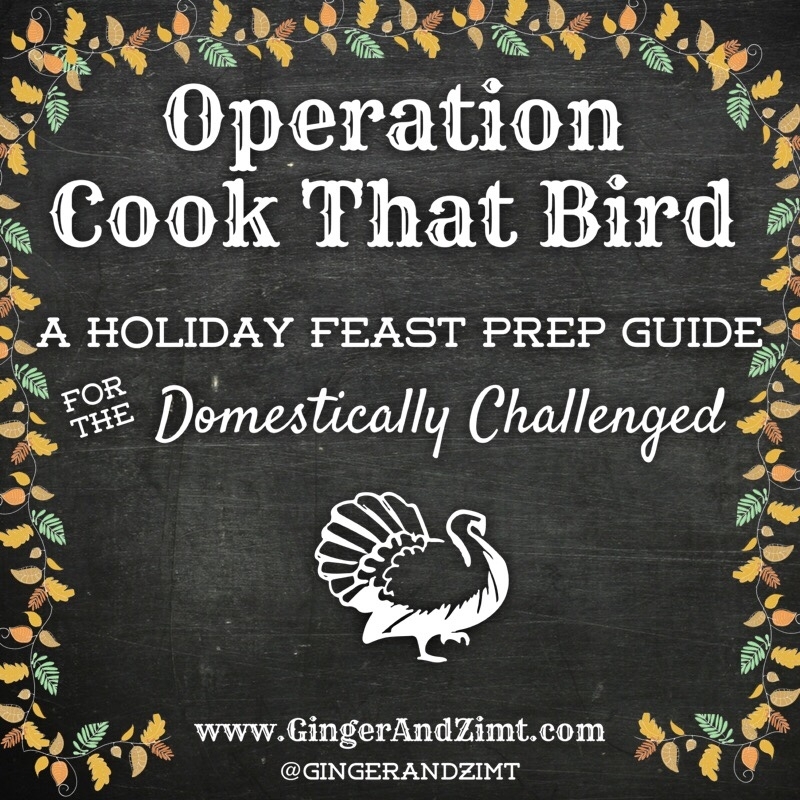 Today I’m sharing my tried and true “Operation Cook That Bird” plans with you. It is a simple and streamlined Holiday Feast Prep Guide, perfect for anyone who is Domestically Challenged, Time Challenged or simply new to preparing a Holiday Feast. 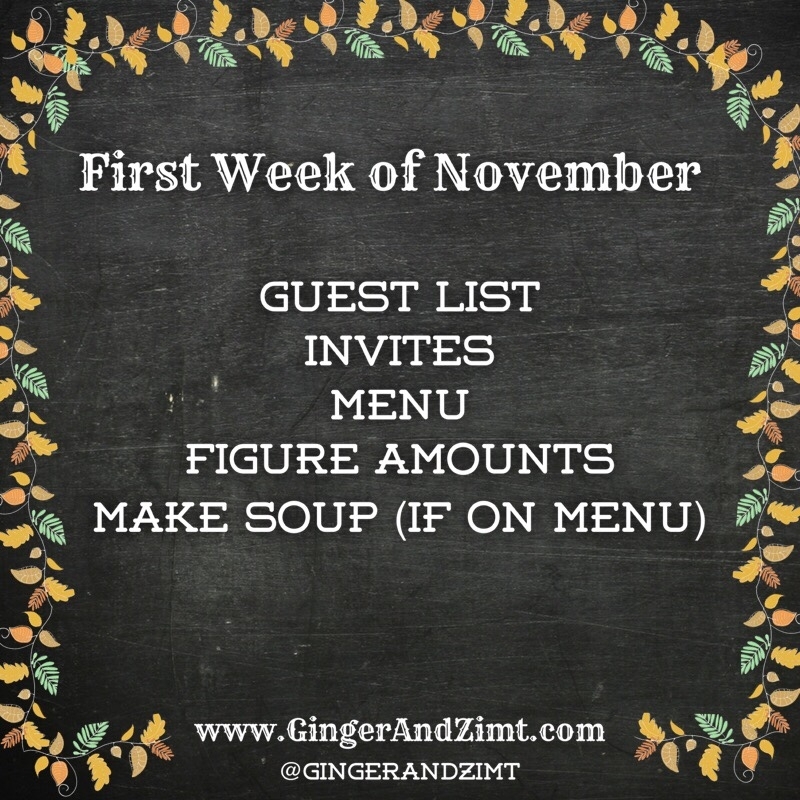 This is the plan I use for ALL our holiday celebrations throughout the year, just swapping out menus as needed! Since every family is different, what works for me might not work for you. As you read along, just take the key concepts that you think will work best for you and leave the rest! There is NO right or wrong way to do things. Experiment with different methods, mix & match ideas, and you will eventually come up with a plan that is uniquely yours! I am including a basic menu with recipes that are delicious all on their own, and easily adaptable to your personal tastes. 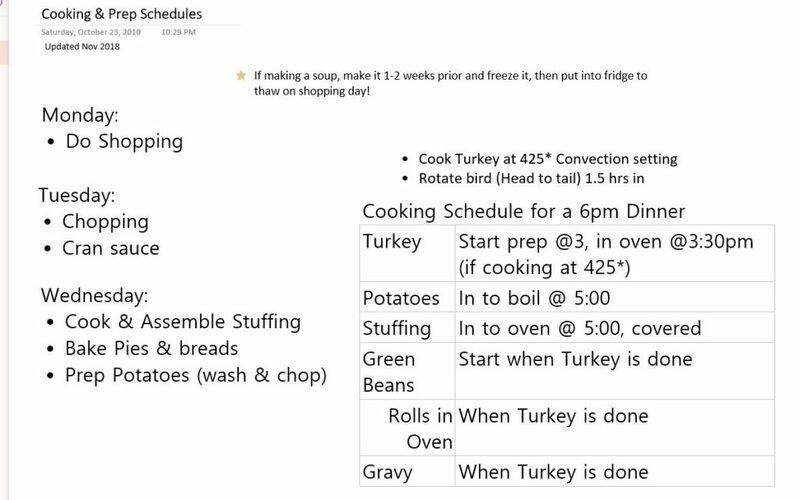 I highly recommend creating a binder or online notebook to hold your family’s Holiday Feast Plans & Recipes, with yearly notes of what worked and what didn’t. Having everything in one place and being able to reference back year to year makes future prep work SO EASY! I love that my menus and shopping lists are already done, and all I have to do is print them out on shopping day! I use a simple white binder with sheet protectors for my hard copy, and I use Microsoft OneNote for my online version because I can connect to it from anywhere. We have a small family with all or our extended family living out of state, therefore my plans are designed for parties of 4 – 20 people, with out-of-town family, and one person doing ALL the cooking. If you have a large, in-town family and are able to delegate dishes, it’s a whole lot easier! Also, while I am no longer Domestically Challenged, thanks to a combo of ADD and Dyscalculia I will forever be Time Challenged. The schedules in my plan are set up to externally manage these unique time issues and keep me on track for success. – Select your menu and figure out how much of each dish you will need based on your guest list. – If your menu includes a time consuming soup, make it now and freeze, then bring it out to thaw in the fridge on the Monday of TG week. 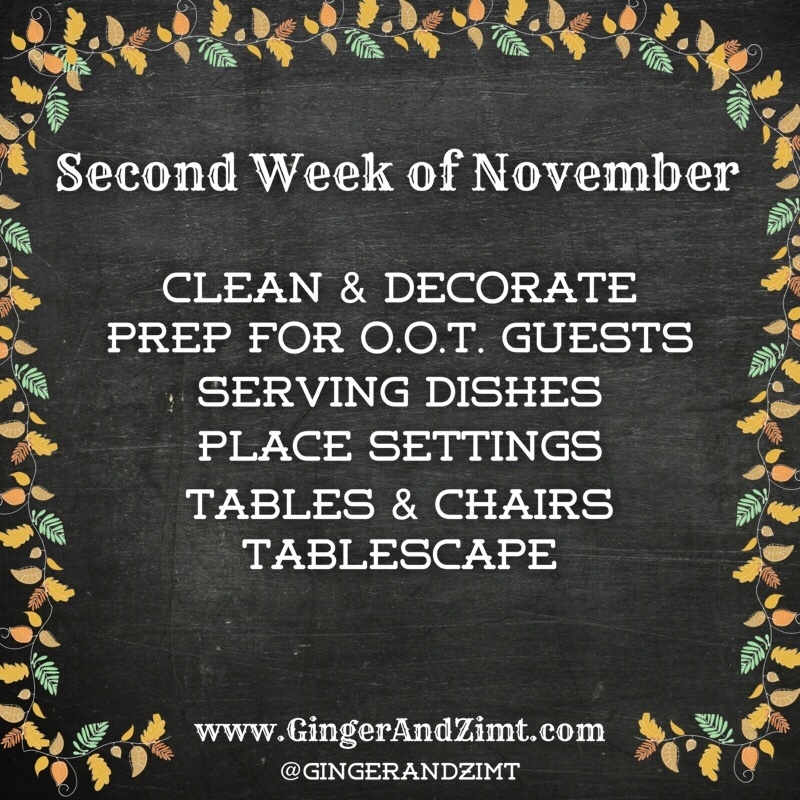 – Clean your house & decorate NOW because there won’t be time next week for more than a quick touch-up! – Prep linens, towels & bedding for overnight guests if you will have any. – Figure out your serving dishes. If you store them be sure they are clean and free of dust. Be sure you have something in which to serve every dish on menu and label the dishes w post-its now so you know what’s what on feast day. 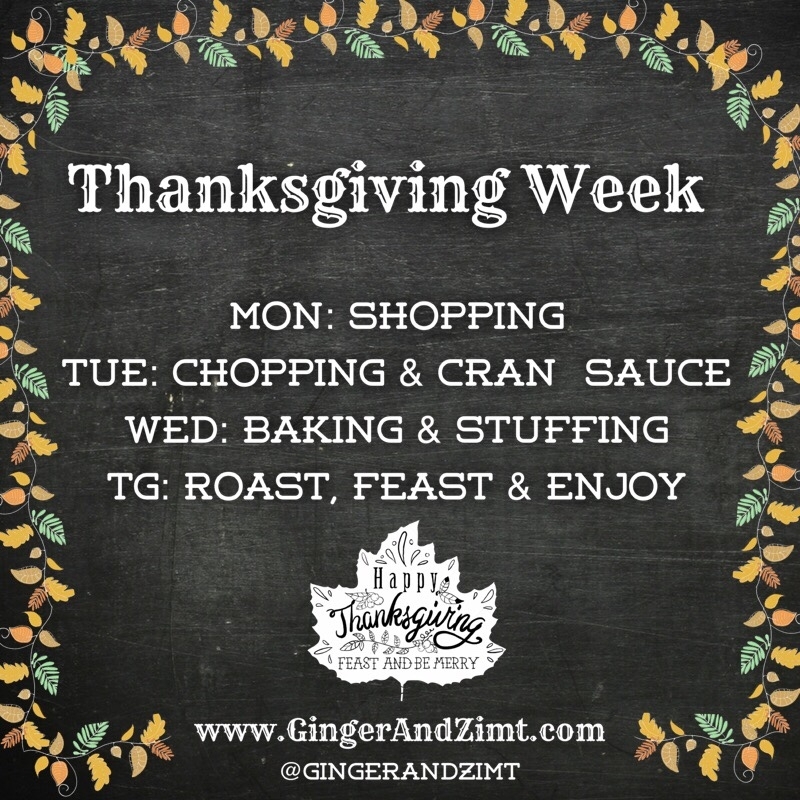 – Monday : Shopping – Monday is before the crowded Holiday shopping rush and you’ll beat the weekend lines! – Thanksgiving Day: Enjoy your company and start cooking the bird! If you don’t already keep a stocked pantry with staples such as flour, sugar, vanilla, dried herbs & spices, you will need to go through all the recipes to be sure you have EVERYTHING you need added to your shopping list. The shopping list included here assumes you already have these staple ingredients on hand. 1 cup orange juice – Fresh Squeezed is worth the extra effort but store bought is ok, too. In a medium saucepan over medium heat, dissolve the sugar in the orange juice. Stir in the cranberries, and cook until they start to pop (about 10 minutes). I continue to cook and start smashing the berries as they pop. Once the sauce is your preferred texture and begins to thicken, remove from heat, and transfer to a bowl. 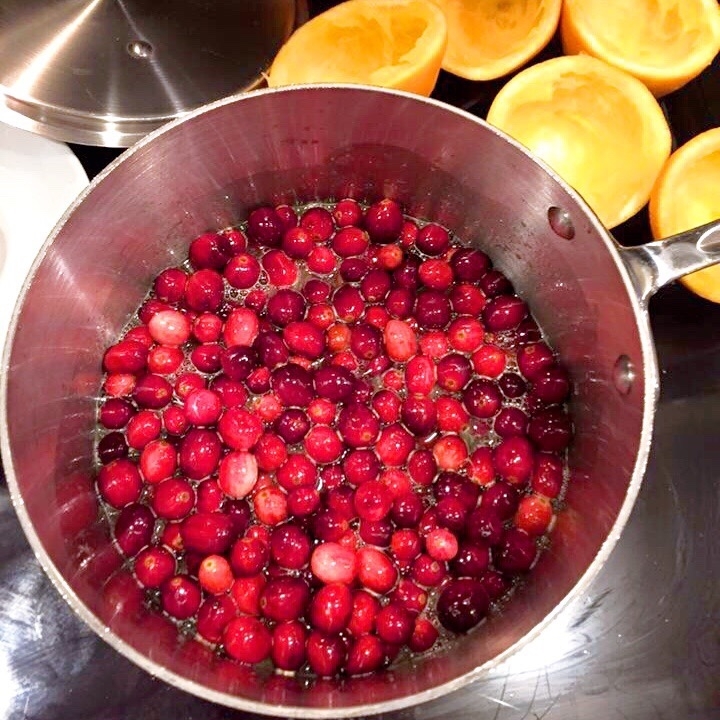 Cranberry sauce will continue to thicken as it cools. Cook sausage in a skillet over medium heat, then remove the sausage and set it aside in a bowl. In the same skillet, melt butter and cook onion, celery & mushrooms, stirring frequently. Spoon the cooked sausage & vegetables over bread cubes and toss to mix. 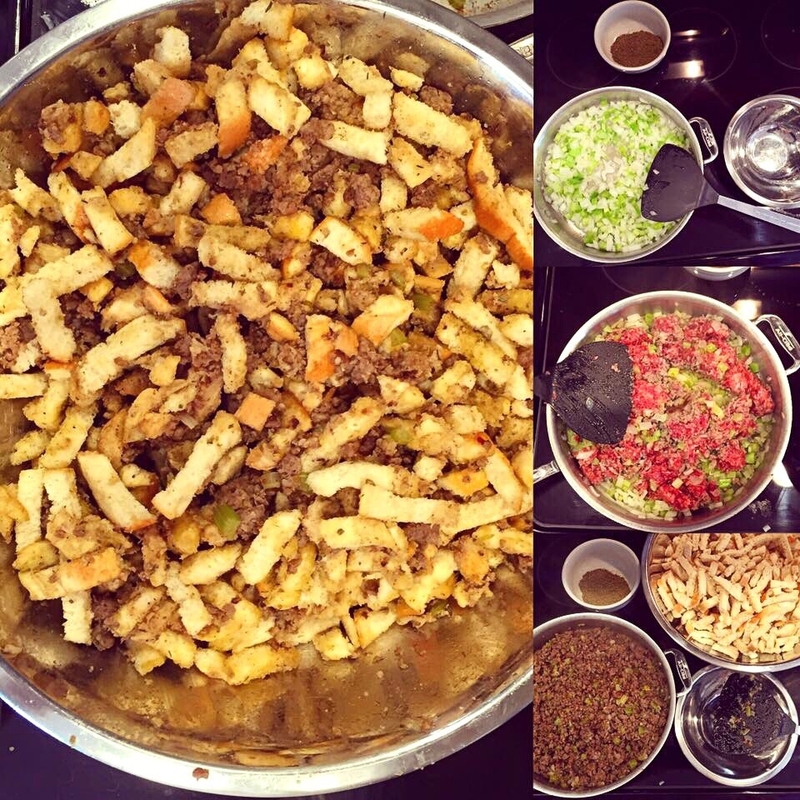 Mix your dry seasonings in a small bowl then add it to the stuffing and toss to mix well. Add 1 can (about 1.5 cups) of broth (just enough to moisten but not be too wet) and toss to mix. Cover and refrigerate until you are ready to bake it. To bake: Transfer as much stuffing as will fit into a 9×13 inch baking dish or other large casserole dish, without overloading it. Spray dish w no-stick spay first! Add a second can (or cup) of broth to moisten. Bake covered for 45 minutes to 1 hour, then uncover, mix, and let brown. Pay close attention and mix every 10-15 min for even browning and to avoid burning. Bake @ 375* but I cook it along side our turkey at 425* for a little bit until the turkey comes out and then I turn down the temp. 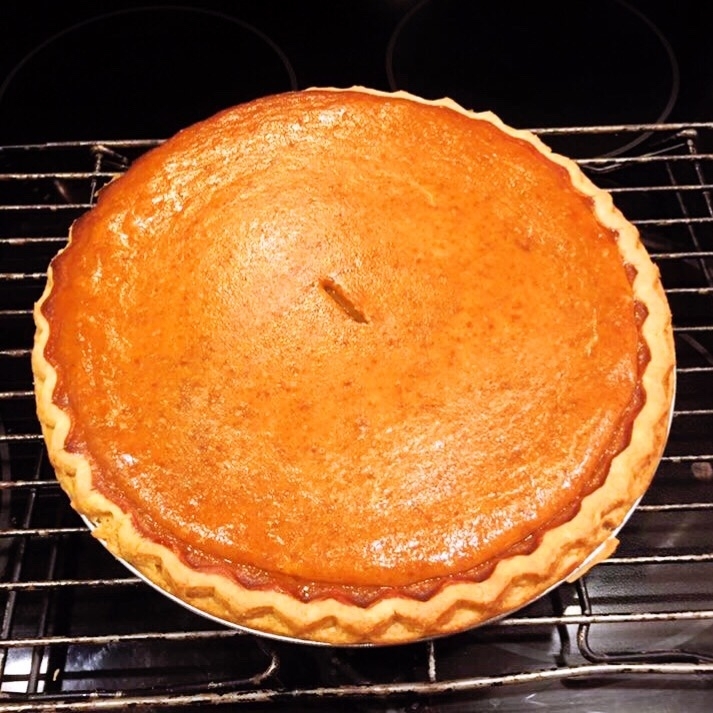 This is the traditional holiday pumpkin pie. This classic recipe has been on LIBBY’S® Pumpkin labels since 1950. This pie is easy to prepare and even easier to enjoy. Just mix, pour, bake for a delicious homemade tradition. BAKE in preheated 425° F oven for 15 minutes. Reduce temperature to 350° F; bake for 40 to 50 minutes or until knife inserted near center comes out clean. Cool on wire rack for 2 hours. Serve immediately or refrigerate. Top with whipped cream before serving. With a hand mixer, beat cream and sugar until you have firm peaks. Fresh Turkey Breast – plan for 2/3 Lb per person. – I look for the largest I can find, and hope for at least an 8-9# Breast. – I buy two smaller ones if needed. – Frozen ok but fresh is preferred. Remove breast from packaging and place it breast side up into a 9X13″ baking dish. – It’s ok if it’s tilted to stand up. – You can use wads of foil wrap on each side of the turkey to help support it if necessary. Check cavity for other parts, removing them if you find any. In a small dish, create a dry rub by mixing together some salt, pepper, and your choice of dry seasonings. Rub this all over the turkey, even in the cavity. Insert the pop-up thermometer into the breast meat, following instructions on packaging. Pour about 1 cup of broth into the pan, and if you have it, put cut lemon and rosemary sprigs into turkey’s cavity. Preheat oven to 425*, using convection setting if you have it. Place turkey in oven facing breast to front. Cook for 60 min, then rotate so it’s facing back to front. Do not baste! Cook for another 20 min then check the pop-up timer. – If it hasn’t popped, continue cooking and checking every 15 min until it pops. – check temp with a digital thermometer to confirm the pop-up timer is correct. Let turkey sit and rest for 15-20 min then remove to a cutting board for carving. Melt butter over medium heat in a sauce pan. Add the Flour mix to the melted butter and whisk well until it’s nice and smooth. Continue whisking and cooking until it takes on a light tan color and resembles wet sand. About 3-5 min. Add pan drippings and keep whisking. Keep whisking and cooking for several minuets, until it is your desired consistency. Remove from heat and serve in a gravy boat or bowl. just wash and steam or microwave until they’ve reached your preferred tenderness! 2-4 large sweet potatoes or yams, cut into pieces. Boil potato pieces until tender and skins fall off. Drain and return to the pot. Add 1 stick of butter and cover with a lid while it melts. Add cream and mash with a potato masher untill fluffy. Now, Relax & Enjoy Your Feast & Family Time! After days of prep work the meal is usually devoured in less than half an hour, and you can toast to your success!!! 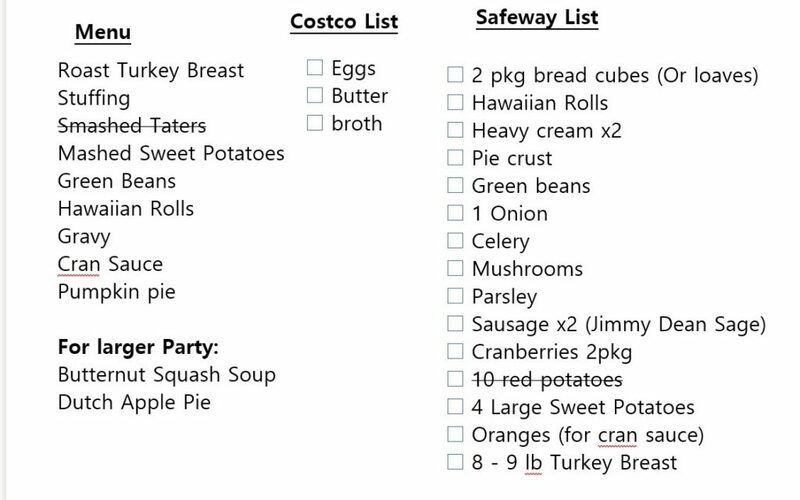 I hope this Holiday Feast Prep Guide was helpful to you! Remember, the most important part of a Holiday Feast is to enjoy your time together with friends & family and treasure those moments. 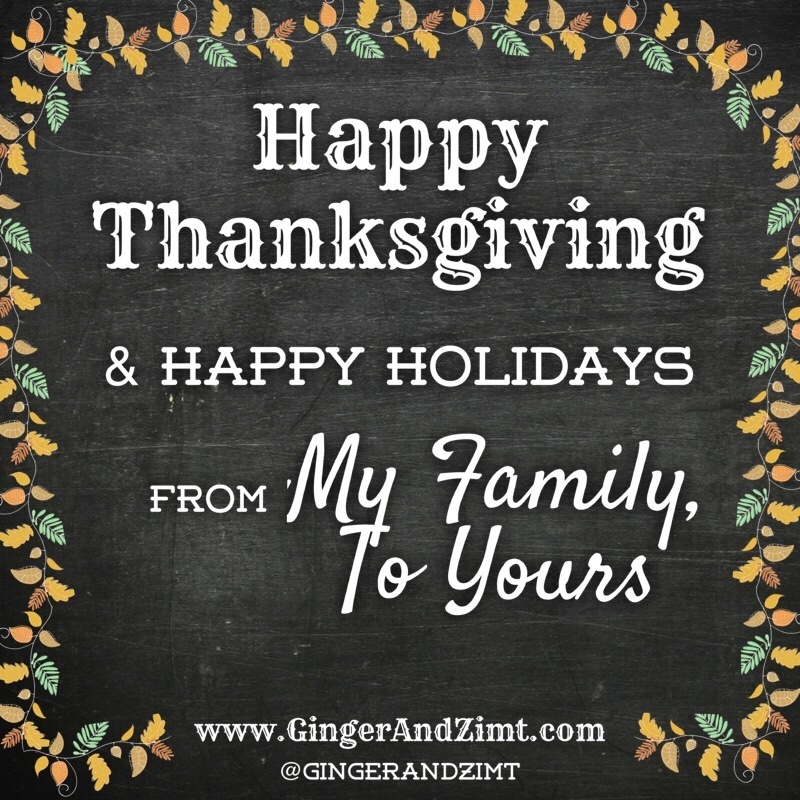 I wish you all a Blessed Thanksgiving and a Fabulous Holiday Season filled with BLISS!! !